A hard contest with the big difference that Chelsea had the cutting edge today. Games are won and lost on goals and with Cisse’s brilliant double still fresh in the memory, it was Torres’ turn for centre stage this time. He showed why he could still be worth his outrageous transfer fee with their glorious second goal, though no doubt everybody connected with Chelsea is just as (even more so?) happy with his disgraceful diving antics such as the ‘perfect 10’ he achieved when he won the crucial penalty. Despite a couple of loose balls in midfield, Anita did well in his first Premier League start, particularly having also played in Greece less than 48 hours beforehand. However, he’ll have to wise up to characters like Torres, the Dutch midfielder going to make a challenge before pulling his foot back, only for the Spaniard to make sure he made some contact and his theatrical tumble doing the rest. Despite Chelsea controlling possession, Newcastle had looked relatively comfortable with only a couple of scrambles to survive before Phil Dowd pointed to the spot in the 22nd minute. Tim Krul made a great attempt but was possibly outdone by making a move to the left before launching himself correctly to the right, Hazard’s penalty though eluding the Dutch keeper’s fingertips to go just inside the post. 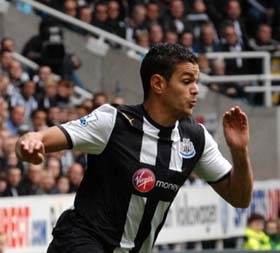 Newcastle kept possession well themselves but it was only when Ben Arfa got the ball that there looked to be the possibility of breaking through. The ball at time seemingly stuck to his foot as Chelsea hunted in a pack whenever he had the ball. Despite this he managed to pick out Ba with a lovely flighted ball that would have been potential goal of the season if he could have made a better connection but the shot was miscued under pressure. Later his persistence forced the ball through to Cisse just inside the area and his snapshot was fired off first time but Cech fortunate to be in just the right place. The pick of Hatem’s contributions though was facing three players on teh edge of their box, he jinked and then jinked again, somehow making space to get his shot off. It was cleanly struck and beat Cech but also the post. Cabaye looked more like his usual self and put in a decent display but with seconds to go of the first half it was all over. Some brilliant interplay on the edge of our box led to Hazard backheeling to Torres who hit the top corner just beyond Krul’s dive, a great goal but unlucky for the keeper. The second half brought no changes in either personnel or tactics for Newcastle. We had our best available players on the pitch and not a lot of potential inspiration on the bench. I thought Newcastle did more than OK in that second period and correctly showed patience as they looked to find a way back into the match, charging forward would have had a predictable and fatal outcome. A few half chances came the way of Cisse amongst other but with 84 minutes on the clock it was Ba who was presented with a great opportunity from ten yards. His shot well save d but really he should have gave Cech no chance. A goal then would have made for a very interesting last ten minutes and a combination of Chelsea having sat back and Newcastle everything to fight for could have seen a dramatic finale. Simpson, Santon and Cabaye made way for Ryan Taylor, Marveaux and Perch but by then I think Alan Pardew was just looking after his players while still hopeful Ben Arfa or his two strikers could work a bit of magic. By only giving Marveaux the last sixteen minutes it doesn’t look like the manager has the greatest faith at the moment in the midfielder as a game changer. It wasn’t to be though as Newcastle finished the match with a bit of pride from the second half performance and the fact they kept their shape, Chelsea though kept hold of all three points. 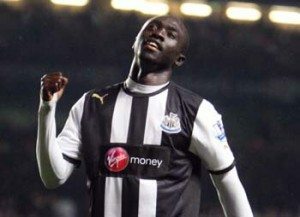 Whether the presence of Cheick Tiote would have made a difference is of course an unknown.